After trying to solve the problem of gathering enough money to pay for this semester's fees, I had to admit defeat. Yesterday, 2 days after the closing date to pay the fees, I applied for a leave for this semester. 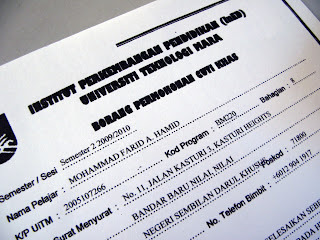 Unfortunately, since I already had passed the final date of 4 February, 2010 imposed by Bendahari UiTM to all students, I was declared "GUGUR TARAF" or GT. This means I am no longer a student, and cannot apply for sabbatical leave. The call from UiTM really taken me aback, after 8 semesters of slogging, I am no longer a student. However, Puan Shamsiah asked me to appeal for a reinstatement, THEN only apply for the sabbatical. I have attended the first 2 seminars for this semester, conducted a presentation, sat for a test, argued with Professors, prepared for my assignment submission, but now have to sit back and watch my colleagues go on with the course. Very sad day indeed. I don't blame anyone for this, but myself for putting too much confidence on my recovery in business to be able to pay in time for this semester. If I had known, I wouldn't even register for the two papers. Well, if I had known, I would have scraped, steal or beg, and horde away the smallest morsels of RM for me to pay the fees. For some RM696.00 is just a weekend spending at KLCC or Pavillion, but for me, that could be 2 or 3 month's income. Such are the perils of running your own business. No money, no business, no business, no money..
Don't say "why don't you borrow the money from relatives or friends or even me?" I have borrowed enough, I have inconvenienced many, I may have offended some for even asking, and I am not going to beg. I used to pay for some relatives' education, give pocket money without the parent's knowledge, just to ensure they can study in peace, for their future. I wish someone would return the favor, but apparently they are deaf, mute and dumb. I was not even invited for their graduation, so I understand..
Now, all I can do is to be patient, work harder, sleep less, be stingy, be uncaring of others, be compassionate-less, and be tough. This is just a small hurdle in my quest for education. 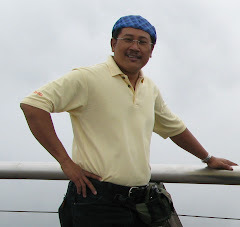 Prof. Madya Dr. Syed Abdul Jamal Nasir, I'm sorry to disappoint you. I know you are eager to see my proposal papers. I know you put great hopes on me by the way you really scrutinize my test papers. I enjoyed our banter, arguments and discussions for education sake. I'll be back, and that's a promise. Prof. Madya Hajah Nor Afizah, you'll be missing the person who always gives you the "real world" outlook to what you are teaching. I hope you like my presentation, I volunteered to be the first, to set an example for my fellow students as to what a product presentation should look like. To my colleagues, I know I promised to work with you guys to produce our proposal, and it is still a promise. I'll help you guys to do a good proposal, even though it means nothing to me as my name would not be on it. I'm not running away, I just have to stand back a bit to let this mishap pass..
As Mr. Arnold SusahNakEja said in one of the Terminator movies "I'LL BE BACK!" Things happen for a reason and God has mysterious ways to work things out. Be strong and keep your chin up. what course bro? master or degree? i hope you can go back there and continue. someday maybe... but not quitting forever yea? GoBlog! in English may look innocent enough, just another call to blog. "Goblok" however in Malay means stupid, idiot or in the office-politically correct word - uninitiated..